Getting into nursing school is not always easy. The ATI TEAS V exam is a significant predictor of how students will do in nursing school. There are a number of tests involved that nursing schools use to measure the strengths and weaknesses of their students, and the ATI TEAS exam is one those exams. Those who participate in ATI testing tend to do better on the first administration of the NCLEX than those who do not participate in the testing. As stated above, the ATI TEAS V is a significant predictor of how students will do in nursing school. Teachers and students use this testing to identify content areas that need additional attention. Some schools use this test to identify the students with the most potential in nursing. This test measures student performance in four areas. The 170-question test measures comprehension by providing 13 sub-scores for an even more specific assessment. The TEAS V exam makes it easy to identify topics for additional remediation so that students can succeed in nursing school. Professors and nursing school administrators can use the result to identify area that need strengthening in their nursing curriculum. Nursing students have 209 minutes to take the exam. ATI provides 2 online practice assessments (Form A and Form B), a study manual, and a study package so that students can meet success on the ATI TEAS V exam. The TEAS examination is structured around the admission needs for nursing programs. The exam tests entry-level skills needed to pass nursing courses. The exam has 4 sections that include: science, math, reading, and English and language usage. Nursing student can take the exam in either the computer format or the paper and pencil format. The TEAS exam is in multiple-choice format. The reading section contains 50 questions that require nursing students to use logical reasoning to form conclusions and make inferences about information in passages. The math section contains 45 questions that require students to understand algebraic equations, fractions, metric conversions, percentages, whole numbers, decimals, and proportions/ratios. The science section of the TEAS exam has 30 questions on topics such as science knowledge and reasoning, physiology, chemistry, anatomy, basic physical principles. The English and language usage section has 55 questions that focus of contextual words, punctuation, spelling, sentence structure, and grammar. Students should start studying for this exam well before they apply to nursing school. It is always better to be prepared when taking a test that may determine admission into nursing school. Setting aside a specific amount of time per day to study is very important. Studying should be consistent and productive. Studying the content from the 4 content areas will provide the best chances to pass the exam. Gathering a study group may also be instrumental in passing the exam. It is a good idea to find group members who are strong in a specific content area for more productive study sessions. ATI has a wealth of study material on their website. Students can choose from free and paid study materials to help them pass the exam. Students can also use online practice materials on the website before actually taking the TEAS exam. In addition, using a study guide can help you develop a study plan. Study guides for the TEAS exam helps breakdown the material you need to know for the exam. 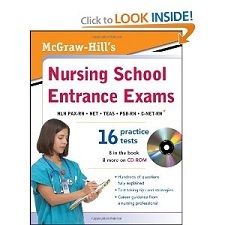 A great study guide many pre-nursing students use to help prepare for TEAS V Exam is called “McGraw-Hill’s Nursing School Entrance Exams with CD-ROM“. Each individual college and university determines its own passing score on the TEAS V exam. Students should check with their individual programs to determine what scores they need in the 4 core areas and the composite score necessary to get into nursing school. Students receive test scores that report the results in the following areas: national mean, percentile rank (program), adjusted individual score, program mean, and percentile rank (national). They receive these scores for each of the following: math, science, reading, and English and language usage. The scores are very descriptive so students and professors both have a clear indicator of the overall performance of each student and the areas of concern for future studies. What is considered good scores varies by nursing school. The minimum scores are based on the admission requirements for each school. Good nursing schools generally require that student score an 80% on the reading section and a 70% on the science, math, and English and language usage section. Doing well on the ATI TEAS V exam is imperative to students’ nursing school careers. They must take the exam seriously, and they should use the test results to help them create a study plan for their nursing programs. ATI provides straightforward information about testing results to help students meet success in nursing school.